Traditionally thought to be a disorder of childhood and adolescents, there is increasing evidence that the condition is prevalent in adulthood and can lead to significant disability. In this article, we focus on the neurobiology of ADHD and the different models hypothesised in the genesis of the condition. 5. Diffusion transfer imaging shows alterations in frontal and cerebellar white matter in children and adolescents. 7. fMRI shows reduced activation of prefrontal cortex and striatal regions. The dorsal and lateral prefrontal cortex regulates attention and motor responses while the ventral and medial portion regulates emotion. It is the last part of the brain to mature, and maturation only occurs in late adolescence. The two key receptors that are situated in the prefrontal cortex are dopamine D1 receptor and alpha-2A adrenoreceptors. The prefrontal cortex exhibits a Goldilocks phenomenon being highly dependent on a balanced neurochemical environment for proper functioning. ADHD is associated with genetic changes that weaken catecholamine signalling and slow prefrontal cortex (PFC) maturation in some cases. Concentrate and sustain attention especially under boring conditions. Focus on material that is important but not salient by suppressing processing of irrelevant stimuli and enhancing processing of relevant stimuli. Inhibits internal and external distractions. Divides and shift attention in multi-tasking. Responsible for attention regulation through its effect on the sensory cortices. Can guide behavioural output by projections to the motor and the premotor cortices along with the basal ganglia and cerebellum. The ventromedial prefrontal cortex (VMPFC) has projections to amygdala, hypothalamus and nucleus accumbens and weakens reactions to disinhibited aggressive impulses and emotional dysregulation. The parietal and temporal lobes provide bottom-up processing, i.e., process stimuli according to inherent salience. The parietal lobe is responsible for orienting attention to parts of space and of time. The DMN is a network of brain regions that are active when in a ‘resting state’ and tend to be negative correlated with attention networks. Negative correlations between the DMN and the frontoparietal control network are weaker in patients with ADHD than in people who do not have the disorder. hypoactivation in the frontoparietal area. hyperactivation in the visual, dorsal attention, and default networks. The neurotransmitter dopamine is implicated as the main mediator of the brain’s reinforcement signal. Dopamine cell bodies lie in the pars compacta of the substantia nigra (SN) and the ventral tegmental area (VTA). We cover the dopamine pathways in more detail here. The substantia nigra projects to the dorsolateral striatum and is responsible for motor control. The ventromedial projections from the ventral tegmental area (VTA) are responsible for cognitive and affective function. The physiological effects of dopamine transmission in the brain are mediated by G-protein coupled receptors. There are five key receptors: D1 to D5. Each of these is situated in different parts of the brain and perform different functions. D4 and D5 receptors are found at lower levels in the striatum and moderate levels in the prefrontal cortex. Low to moderate levels of D1 receptor stimulation can improve prefrontal cortex functioning. Stimulation of D1 receptors weakens the neuronal signal and is responsible for decreasing ‘noise’ by pruning inappropriate connections. Excessive D1 receptor stimulation (such as occurs during stress) impairs PFC function by weakening too many network connections. burst-like firing in response to events connected with reward. Normally, cells tend to respond approximately 200 ms after the delivery of an unexpected reward. Thus, DA and NE have complementary beneficial actions with NA increasing the signal and DA reducing noise, and an optimal balance of both neurotransmitters is required for proper PFC functioning. The neurons in these networks interact with other pyramidal cells through synapses on dendritic spines which contain NA alpha-2A receptors or D1 receptors. These pyramidal glutamate neurons are inhibited by GABA, which in turn is suppressed by the D4 receptor. Thus, activation of the D4 receptors suppresses GABA, which in turn activates the pyramidal glutamate neurons. Not much research has been carried out on the D4 receptor; however the D4 receptor can be stimulated by NA and DA and deficient stimulation of the D4 receptor can impair PFC functioning by weakening glutamate release. The reward network underpins two key dopamine related neurochemical deficit theories. The model proposes that due to the steep delay of reinforcement there is a critical window during which reinforcement of behaviour can occur in individuals with ADHD. The steep and shorter delay of reinforcement is caused due to lower levels of tonic dopamine. Thus, a reinforcer loses its value relatively quickly, which makes it difficult to change behaviour. Only short sequences of responses can be reinforced due to the short critical window in which behaviour can be reinforced. Children therefore, tend to respond better to immediate rewards over delayed rewards and only show learning when rewards are received immediately and frequently. Furthermore, due to the lower tonic dopamine levels, there is only a blunted dip in the phasic dopamine after the omission of the reward. Thus, there is a slower extinction of behaviour. In normal children, the gradient is not as steep and is gradual, thus allowing a greater window of opportunity where children can obtain adequate reinforcement from delayed rewards. According to the dopamine transfer deficit, this assumes that there is a normal tonic level of dopamine but the phasic dopamine response to reinforcement is altered. The model proposes that the anticipatory dopamine cell firing is disturbed whereby the dopamine response does not transfer to earlier and earlier predictors of response requiring actual instances of reinforcement for control of behaviour rather than predicted behaviour. In children with ADHD the phasic dopamine cell response to cues that predict reinforcement is reduced in amplitude to the point of being ineffective and similarly when the reward is taken away there is a blunting of the phasic dopamine decrease response leading to slower extinction of behaviour. The dopamine transfer deficit explains the symptoms of inattention as the child fails to give close attention to details and makes careless mistakes and cannot maintain on-task behaviour as there is an absence of the continuous reinforcement of attending by anticipation of dopamine release. Similarly, it also explains hyperactivity and impulsivity, where the child leaves the seat in the classroom where remaining seated is expected due to lack of effective reinforcement, i.e., lowered phasic dopamine response to rewards. Impulsivity may also be explained as there is a delay between the target behaviour and actual reinforcement. The fidgetiness may be due to activating effects of dopamine due to excitability of striatal neurons. Greater emphasis on immediate rewards than delayed rewards. Poorer performance under partial or discontinuous reinforcement schedules. Impaired reinforcement learning and acquisition of behaviour. Impaired integration of earlier reinforcers. Impaired ability to change behaviour in response to changes in reinforcement contingencies. Impaired response to conditioned than to actual reinforcement. Problems with adding new contingency information in the working memory. Behavioural inhibition less under the influence of cues of aversive stimuli. Lower level of tonic dopamine in frontal-limbic circuitry in the brain and hypodopaminergic state. Smaller phasic dopamine response to actual rewards. Slower shift in dopamine from actual reward to reward cues. Reduced phasic anticipatory dopamine release in striatum to reward cues. The observed clinical variability of ADHD may indicate the possibility of multiple developmental pathways. Since Barkley theorised in 1997 [Barkley, 1997] that normal behavioural inhibition was necessary for attention and executive function, there have been a number of subsequent neurobiological models proposed. Most of these models have been attributed to delayed development within the later maturing areas of the brain that affect attention, decision-making, and reinforcement learning. This model involves the inadequate production of lactate by astrocytes in the brain. Astrocytes take up glucose from blood vessels and convert it to glycogen and lactate, with the latter being released for the neurons to metabolise into energy (ATP). Therefore, the insufficient provision of neuronal energy creates a state of hypo-energy. There is an approximate loss of 15-25% of neurocognitive energy that can be applied to any one task, which results in attention drifting and mental fatigue. This model postulates that there is a dysregulation in the regulation of vigilance (brain arousal), which underlies the attention deficits in ADHD. This model has pathogenetic relevance to both ADHD and mania whereby unstable or low vigilance can induce an excessive autoregulatory attempt to stabilise vigilance. This is how periods of hyperactivity are proposed to occur. Advances in MRI techniques have shown researchers that the observed phenotypic variations in ADHD are a result of impairments to top-down cognitive processes that are important for organising behaviour. The executive control network is implicated here. The implications of disrupted executive processes and functions affect reward-related processing, inhibition, vigilance, reaction time variability, and emotional lability. This model proposes that escape from delay is a key reinforcer for children with ADHD, as the delay appears to have a negative association. When delay cannot be reduced, children will engage in behaviours that reduce the perception of the length of delay or engage in behaviours that act as immediate reinforcers such as fidgeting and attending to alternative stimuli. In terms of neurobiological mechanisms, the delay aversion is due to a reduced efficiency of dopamine in reward circuits signalling future rewards and a steeper and shorter delay-of-reinforcement gradient in children with ADHD. Sonuga-Barke incorporated the delay aversion model within the dual pathway model. According to the dual pathway model, it proposes there are two independent neurocircuitries linked to ADHD, namely the ventrolateral and dorsolateral corticostriatal circuitry subserving executive and inhibitory processes and mesolimbic-ventrostriatal circuitry subserving motivational and reward processes, so there are abnormalities in executive processes and motivational processes. This model is a refinement of the dual pathway theory and explains the neuropsychological heterogeneity of ADHD as a combination of one or more deficits in inhibitory control, motivational control, and temporal processing. reduced ability to exert control. 2. Dysfunction in dorsal striatum might lead to differences in the ability to predict what events are going to occur, whereas dysfunction in ventral striatum is more likely to lead to deficits in motivation and reward processing. The neurobiology of ADHD is complex and involves multiple brain pathways. Two key neurotransmitters highlighted in the pathogenesis of ADHD are dopamine and noradrenaline. As neuroimaging advances, different subtypes of ADHD may emerge involving distinct pathways giving rise to a specific set of symptoms. By combining this with an understanding of the neurotransmitters we may be able to develop and target treatments for better outcomes. Polanczyk, G., de Lima, M. S., Horta, B. L., Biederman, J. & Rohde, L. A. The worldwide prevalence of ADHD: a systematic review and metaregression analysis. Am. J. Psychiatry 164, 942–948 (2007). Young, J. L., & Goodman, D. W. (2016). Adult Attention Deficit/Hyperactivity Disorder Diagnosis, Management, and Treatment in the DSM-5 Era. The primary care companion for CNS disorders, 18(6). What is the prevalence of adult ADHD? Faraone S and Biederman J. What is the prevalence of adult ADHD? Results of a population screen of 966 adults. J Atten Disord. 2005;9:384-391. Faraone S et al., The age-dependent decline of attention deficit hyperactivity disorder: a meta-analysis of follow-up studies. Psychol Med. 2006;36(2):159-165. Faraone S and Biederman J. Can Attention-Deficit/Hyperactivity Disorder Onset Occur in Adulthood? JAMA Psychiatry. 2016;73(7):655-656. Diagnostic and statistical manual of mental disorders (5th ed.). Tripp, G., & Wickens, J. R. (2009). Neurobiology of ADHD. Neuropharmacology, 57(7-8), 579-589. Swanson, J. M., Kinsbourne, M., Nigg, J., Lanphear, B., Stefanatos, G. A., Volkow, N., … & Wadhwa, P. D. (2007). Etiologic subtypes of attention-deficit/hyperactivity disorder: brain imaging, molecular genetic and environmental factors and the dopamine hypothesis. Neuropsychology review, 17(1), 39-59. Polymorphisms of the dopamine D4 receptor, clinical outcome, and cortical structure in attention-deficit/hyperactivity disorder. Shaw, P., Gornick, M., Lerch, J., Addington, A., Seal, J., Greenstein, D., … & Rapoport, J. L. (2007). Polymorphisms of the dopamine D4 receptor, clinical outcome, and cortical structure in attention-deficit/hyperactivity disorder. Archives of General Psychiatry, 64(8), 921-931. Faraone, S. V., Asherson, P., Banaschewski, T., Biederman, J., Buitelaar, J. K., Ramos-Quiroga, J. A., & Franke, B. (2015). Attention-deficit/hyperactivity disorder. Nature Reviews: Disease Primers, 1, 15020. The emerging neurobiology of attention deficit hyperactivity disorder: the key role of the prefrontal association cortex. Arnsten, A. F. (2009). The emerging neurobiology of attention deficit hyperactivity disorder: the key role of the prefrontal association cortex. The Journal of pediatrics, 154(5), I.
Cortese, S., Kelly, C., Chabernaud, C., Proal, E., Di Martino, A., Milham, M. P., & Castellanos, F. X. (2012). Toward systems neuroscience of ADHD: a meta-analysis of 55 fMRI studies. American Journal of Psychiatry, 169(10), 1038-1055. Luman, M., Tripp, G., & Scheres, A. (2010). Identifying the neurobiology of altered reinforcement sensitivity in ADHD: a review and research agenda. Neuroscience & Biobehavioral Reviews, 34(5), 744-754. Sagvolden T et al., A dynamic developmental theory of attention-deficit/hyperactivity disorder (ADHD) predominantly hyperactive/impulsive and combined subtypes. Behav Brain Sci 2005;28(3):397-419. Tripp G and Wickens J. Research review: dopamine transfer deficit: a neurobiological theory of altered reinforcement mechanisms in ADHD. J Child Psychol Psychiatry. 2008 Jul;49(7):691-704. Barkley R. Behavioral inhibition, sustained attention, and executive functions: constructing a unifying theory of ADHD. Psychol Bull. 1997;121(1):65-94. Killeen P et al., A behavioral neuroenergetics theory of ADHD. Neurosci Biobehav Rev 2013; 37:625–657. Hegerl U and Hensch T. The vigilance regulation model of affective disorders and ADHD. Neurosci Biobehav Rev 2014;44:45–57. Baroni A and Castellanos F. Neuroanatomic and cognitive abnormalities in attention-deficit/hyperactivity disorder in the era of ‘high definition’ neuroimaging. Curr Opin Neurobiol 2015; 30:1–8. Hyperactivity and delay aversion I. The effect of delay on choice. Sonuga-Barke EJ: The dual pathway model of AD/HD: an elaboration of neuro-developmental characteristics. Neurosci Biobehav Rev. 2003, 27: 593-604. Durston, S., van Belle, J., & de Zeeuw, P. (2011). 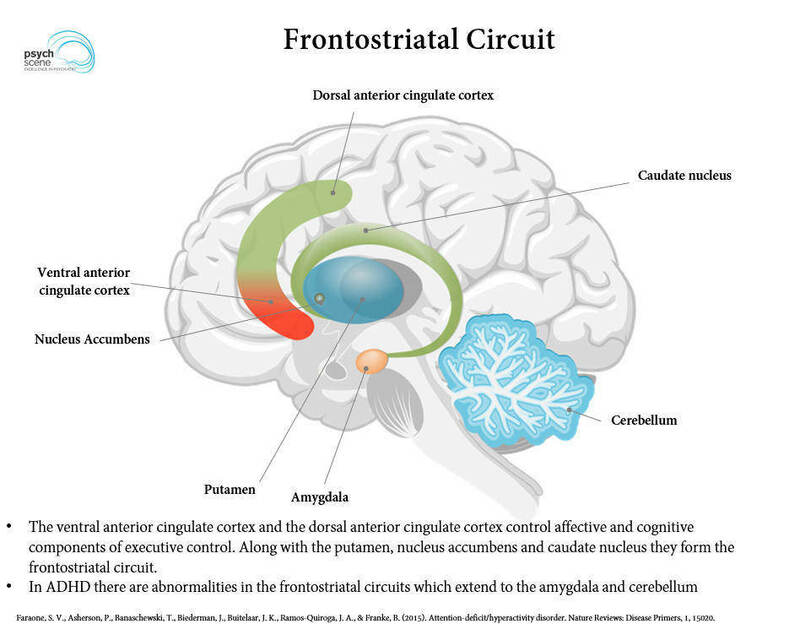 Differentiating frontostriatal and fronto-cerebellar circuits in attention-deficit/hyperactivity disorder. Biological psychiatry, 69(12), 1178-1184.